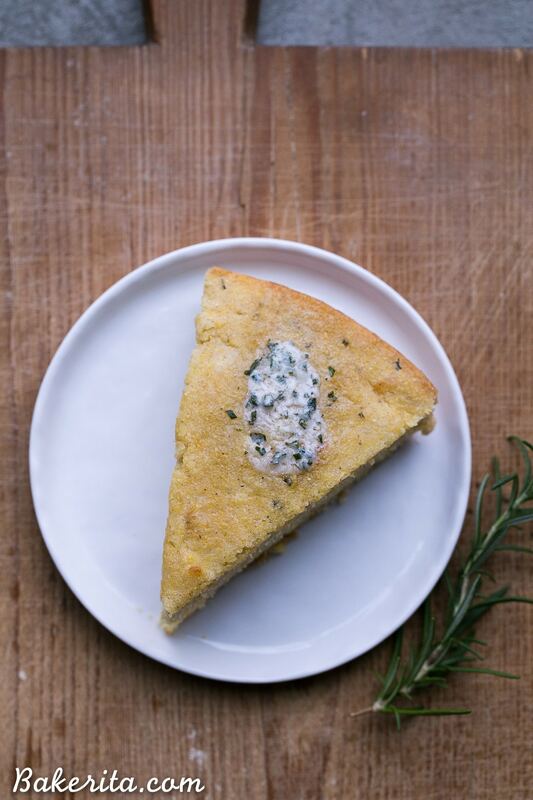 This Gluten Free Asiago Rosemary Cornbread is an easy, savory cornbread that’s moist and flavorful. 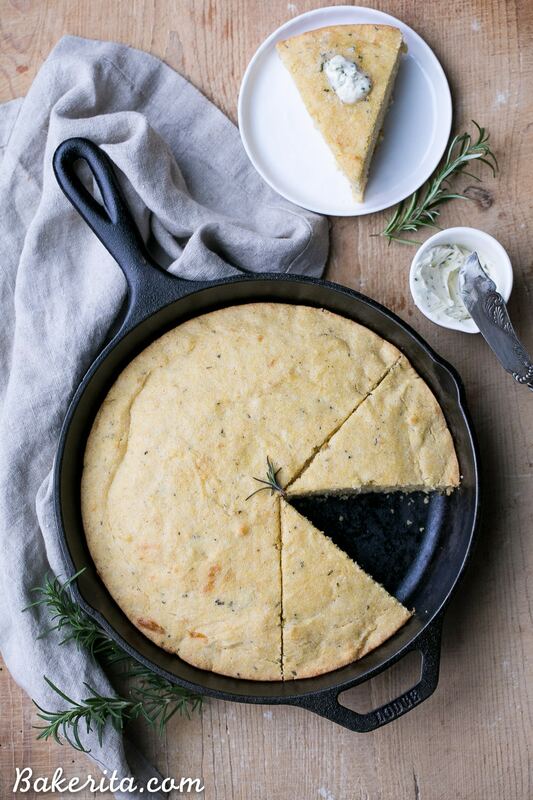 A slice of this gluten-free cornbread is perfect with a slather of butter or served with a bowl of soup! I’ve written about my cute little patio garden before, and nothing makes me happier than having access to tons of fresh herbs right outside my sliding kitchen door. Seriously, when I get grab a couple sprigs of thyme to bring some bright flavor to a chicken dish, or pluck a few basil leaves to chiffonade for the top of my risotto, I get all excited. Food dork, much? Along with my thyme, basil, and peppermint, I’ve got the starts of a rosemary bush as well! Rosemary always calls to me with it’s fragrant, woodsy scent, and I find it to be such an intoxicating flavor – especially during the winter. However, it’s pretty easy to overdo it with rosemary. A light chop to release the oils is all that’s needed to extract some of that wonderful fragrance, and of course, you’ve got to pair it with the right flavors. 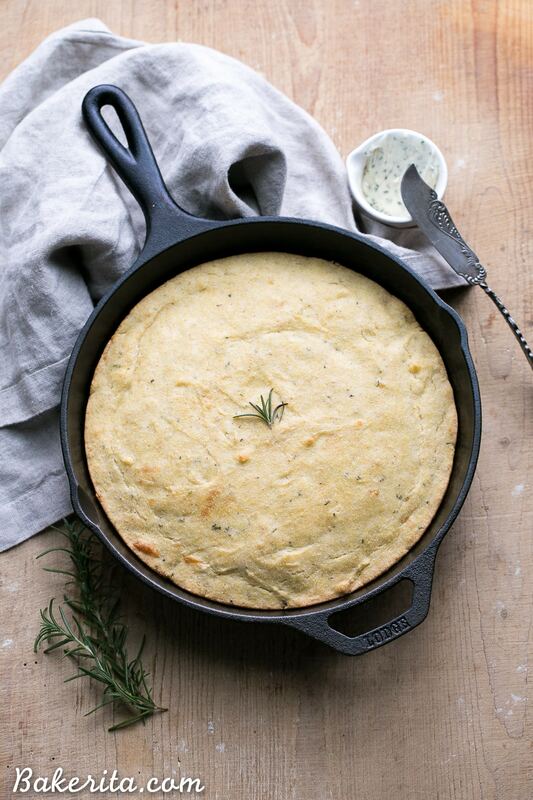 I’ve always loved rosemary in breads, whether it’s a ciabatta, a boule loaf, or cornbread, like we’ve got here! For this cornbread, I used Krusteaz Gluten Free Honey Cornbread Mix – it’s super easy to mix together and there’s a whole bunch of flavor possibilities. The honey cornbread is lightly sweet from the honey, which plays really well with the more savory flavors I brought to the party. The rosemary is a very savory, earthy flavor, and the asiago cheese brings a bit of nutty cheesiness. Though you could opt to use regular vegetable oil, I used olive oil instead because it pairs so beautifully with the flavors of the asiago and the rosemary. I ate chunks of this bread as is and was a very happy camper, but it was even better with my SWOON-WORTHY herb butter. I just chopped up some basil, rosemary, and thyme (from my garden!) and mixed it into some softened butter along with some salt and pepper. 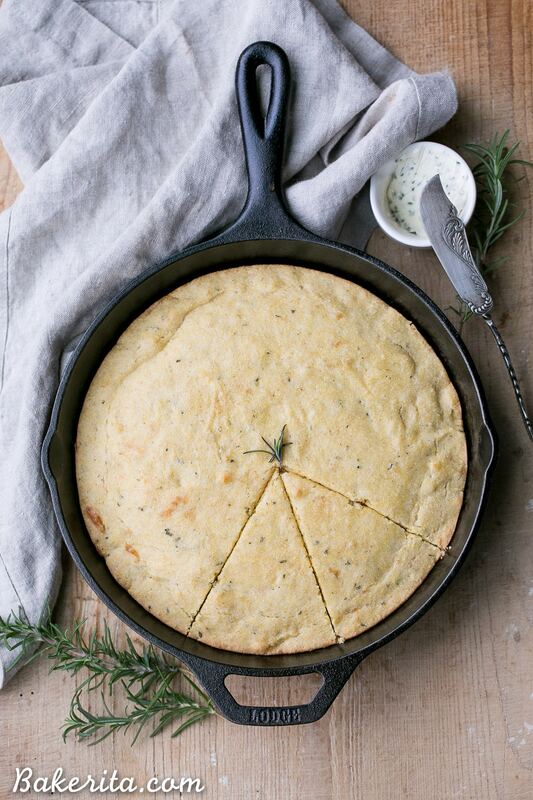 Major swoons – btw this herb butter is good on literally everything not just cornbread. You could also just put some regular butter on it and call it a day. This is also totally the perfect soup or stew accompaniment to make it a full meal. However you want it, it’ll be delicious ;) enjoy! Get the full recipe on Krusteaz's website. This post is sponsored by Krusteaz. Thanks so much for supporting the brands that support Bakerita! I love my herb garden! But several things didn’t make it from the heat this summer so in a few months I’ll be planting some new things! It makes me happy and I’m sure a slice of this bread right now would too! I totally get the happiness over just-plucked herbs. I need to start growin some new ones because I kinda killed all the ones that I had. whoops. Once I start me new garden, I’ll be lookin’ forward to a big slice of herby cornbread. 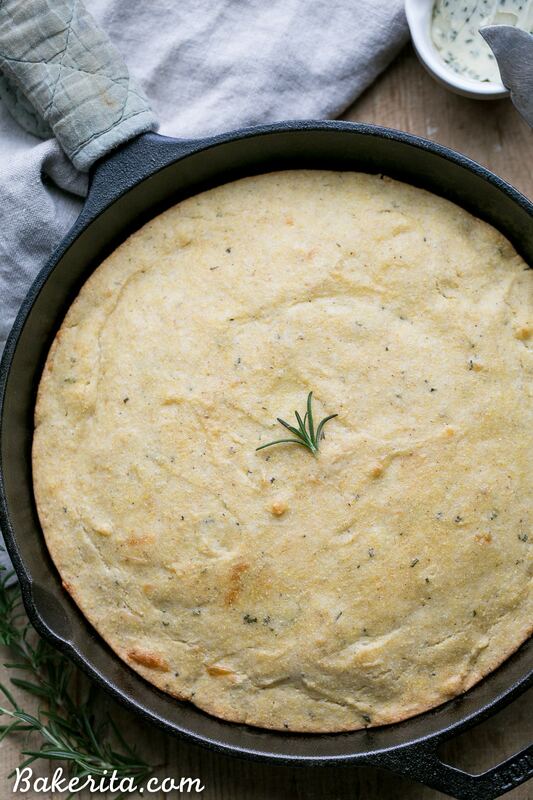 I LOVE rosemary in baked goods, especially ones that teeter between sweet and savory. And cornbread is exactly that. Beautiful. ohhhh I LOVE all the herbs and the asiago! best cornbread ever!